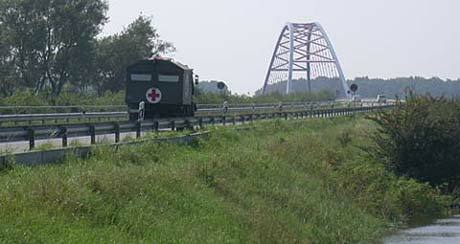 This is also where i took this picture – showing some Red-Cross-Army-Truck approaching the “Dömitzer Brücke”. The atmosphere in that area is tense. Since the rivers are at higher levels than ever before, everybody’s one and only subject seems to be “The Flood”. Farmers are either bringing their goods and animals to safe places or sandbags to where they’re needed most urgent. Convoys of Firefighters, THW, Police, Army, Ambulance and sand carrying Trucks come and go to every direction, rushing through villages, dominating the scene. I actually don’t know what to write – you might have guessed that already. Compared to the floods in China and elsewhere, the european floods are rather easy to handle – but still it is a strange feeling to see your own homearea in such a state of emergency. Only now people seem to understand some of the consequences of “The Flood”, affecting vast areas around the rivers Elbe and Donau. Since the floods moved further down the rivers, scenes of destruction are left behind. Many towns and villages, through wich the floods went, look more or less like devastated battlefields, covered by layers of nauseating contaminated mud. The powers of the waters are the one problem, making buildings collapse, destroying roads and railways (20% of the railroad-tracks of Sachsen-Anhalt have been demolished so far). The other problem is this mud, covering the left behind areas. On the news they only say, it might be a risk for peoples health – nobody should touch it or even eat anything that was in contact with the water. There must be millions of liters of oil, thousands of dead animals, tons of chemicals and who-knows-what-else going down the rivers, endangering natural parks and of going down the drain. It is said that many people have lost “everything” but their lives – although it is not possible yet to overview what has actually happened and what will still happen. It seems as if the only fact that is certain at the moment is, that it is a desaster – and it will cost a lot. I just hope that this crisis will make people think, care and act about the environment more serious. I could now also write again something about cowboys and the Kioto Protocol – but maybe i skip that for now. PS 01:: Sign the Protocol, Mr. Scrub! PS 02:: You may hunt down terrorists or not – but you can’t hunt down the weather! This entry was posted in Environment on 22. August 2002 by tillin.